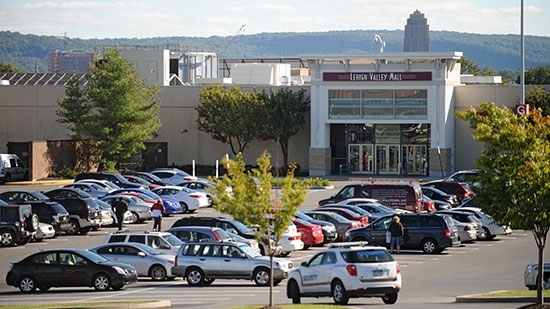 Two people were injured in a shooting at the Lehigh Valley Mall in Whitehall Township on Friday, 6/1. It happened around 7:10 p.m. in the parking lot outside Macy's. Two men were injured and taken to an area hospital. Their condition is not known at the time. Chief Michael Marks with the Whitehall Township Police said that the incident started inside the store as a scuffle before moving outside. Authorities are looking for one male suspect. They ask anyone with information to call 610-437-3042. The Philadelphia Zoo says that two of the missing peacocks were found on Friday morning thanks to a tip sent in by e-mail. The two birds were discovered near the equestrian center in Fairmount Park by a passerby who stayed with them until zoo officials arrived. A flock of four peacocks wandered away from the zoo on Wednesday night. One of them was found dead on Thursday apparently hit by a car. There is still one on the loose. If you spot the animal, you can send a tip with location, day and time, and a photo to peacocks@phillyzoo.org. The zoo is reviewing its long term plans for its flock which has been allowed to roam free on zoo property. Residents in Horsham, Montgomery County, are still under a boil water advisory since Thursday, 5/31. A disinfection system at a township well stopped working. Classes were canceled on Friday for Hatboro-Horsham schools. Some restaurants and other businesses were forced to close. 16,000 residents and 150 businesses are affected. The advisory affects the area between Limekiln Pike, County Line, Blair Mill and Welsh Roads. Utility crews have fixed the system, they are waiting on test results before lifting the advisory. That could come sometime Saturday. UPDATE: The Horsham boil water advisory was lifted on Saturday afternoon, 6/2. Tthe Horsham Water and Sewer Authority says that there was no confirmed contamination of the public water distribution system and the advisory was issued as a precaution. They suggest running your faucet for approximately one minute. For more information read the Lift Notice.